Modern Conservatory designs now allow homeowners to have greater choice in terms of how best to match or complement their properties. uPVC (Unplasticised polyvinyl chloride) Conservatories are probably the most popular type because they are low maintenance and offer good energy efficiency. White is no longer the only option, modern techniques can include shaped moldings, colours and even textures to the design. Conservatories are normally built onto the existing property, but free standing garden rooms can also complement your home in terms of style and your new living space can be project managed from beginning to end including professional advice on requirements for building regulations and planning permission if necessary. 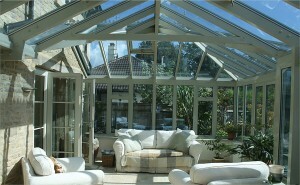 Low emissivity glass (Low-e) glass is available in clear or coloured options. Low-e Glass has a metal oxide coat which helps control heat gain & heat loss. 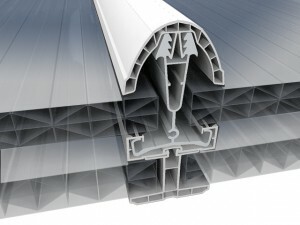 The “air-gap” between the panes can be varied, from approximately 6mm upwards to around 20mm and will have an effect on reducing the sound penetration and energy efficiency. Generally the wider air-gap, the better the units will perform. It’s also important to bear in mind that when the gap becomes over a certain size it could introduce circulation within the sealed unit and undo its thermal properties. Sealed glass units can also be filled with inert gasses such as Argon, in order to further improve the thermal efficiency. For added safety & security, in vulnerable low level places that could be subject to high traffic or accidental impact, toughened safety glass should be fitted. Using Poly-carbonate panels for the conservatory roof are a cost effective alternative to fully glazed double glazed panels. Advertised as more than a hundred times stronger than glass, it’s shatterproof and a lot lighter that glass and can potentially save you money on the overall cost because it could reduce the structural strengthening needed, especially for larger roof sections. With more than a dozen different colours to choose from, there should be something in the new ranges to suit the tastes of everyone and when combined with the wood-grain “foiled” surfaces the finished conservatory looks amazing.